5 May 2008, Colombo, Sri Lanka: It is reported in the Daily Mirror today (http://www.dailymirror.lk/DM_BLOG/Sections/frmNewsDetailView.aspx?ARTID=13708) that Defence Secretary and brother of the President Gotabhaya Rajapaksa in a recent interview had called for the ban on independent media he thought published news stories detrimental to the security forces. This is not the first time the younger brother of the President had openly threatened media. In April 2007 he called the Editor of the Daily Mirror Champika Liyanaarachchi and threatened her, saying that she would escape reprisals only if the resigned. He also threatened to “exterminate” the Daily Mirror journalist Uditha Jayasinghe, for writing articles about the plight of civilian war casualties. In January 2008, Gotabaya Rajapakse openly stated that media has to be censored and criminal defamation brought back in an interview with the Irida Lankadeepa newspaper. The FMM in a statement issued then to condemn this incredible pronouncement averred that chilling warnings from a Defense Secretary with unbridled power without sound judgment was a significant threat to the freedom of expression and media freedom in Sri Lanka. Today, the threats have significantly grown. Nepotism, impunity and effrontery are the hallmarks of a coterie in government who as the RSF noted recently, are predators of media freedom in Sri Lanka. The FMM unequivocally condemns the Defence Secretary’s statements. 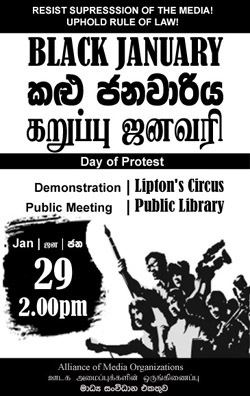 A regime that openly calls for censorship, clamps down on critical voices of dissent and is defined by vulturine thugs who prey on independent media is antithetical with the strengthening of media freedom in Sri Lanka. The FMM seeks urgent clarification these matters from the Government and the President. Statements such as this must be condemned. The Defence Secretary must be held accountable for his words and reigned in. Independent media today faces unprecedented challenges in Sri Lanka in the pursuit of accurate, responsible and impartial journalism. Sadly, the most significant of them come from the Government in the South. Pingback: Global Voices Online » Sri Lanka: Banning independent media?